Read and change all your data on the websites you visit: dataslayer needs this level of permission because tag detection is done by listening to the network for pixels being fired, while data layer detection is done by injecting code into the debugged page. 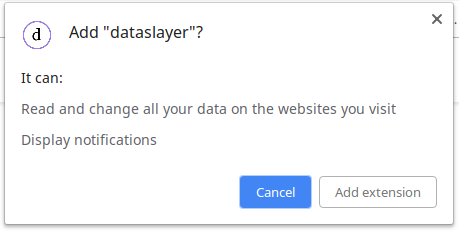 dataslayer does not listen to any of your data for a page until you have opened the dataslayer developer tools panel, and never processes your data anywhere other than on your computer. Display notifications: this is used only to display a notification on initial installation and on future upgrades. Once you’ve installed dataslayer, you can access it via your Developer Tools (Ctrl+Shift+I on Linux / Windows, Command+Option+I on Mac). If installation was successful, you’ll see a new tab titled ‘dataslayer’. Click into this tab to begin your session. If you need to debug the site you’re already on, you may need to refresh the page after opening dataslayer to ensure you capture all data. Each URL visited while dataslayer is active will display as a group within dataslayer. These appear in reverse-chronological order (newest at top). Click the URL to collapse or expand the group; groups automatically collapse when you navigate to a new page. If a tag management system is found, the appropriate logo appears next to the URL; if no supported tag management system is found, a red X appears instead. Data layers and tags for each page live within the group designated by the page URL - data layers on the left, tags on the right. Note that vertical alignment of a data layer entry and a tag does not indicate that the tag was fired by the data layer entry. It’s simply two separate columns of data. For array-type data layers (e.g. GTM), each array entry (dataLayer.push) will appear as a block separated by a light border. This is also the case for load rules. Object-type data layers will generally appear as a single entity. Nested entries can be expanded or collapsed by clicking the + or - next to the entry; shift-click the + to expand all the way down. 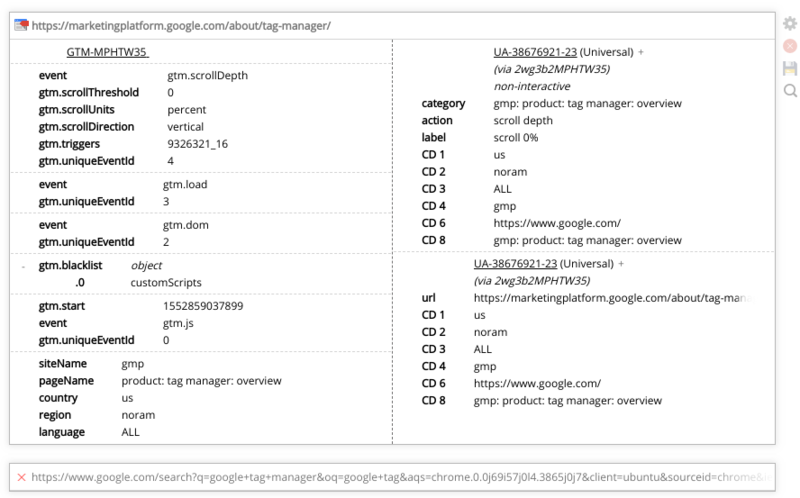 If multiple tag management systems are found on the same page, information on all of them will be displayed sequentially. If multiple GTM containers are found on the same page, a dropdown will allow you to toggle among them. 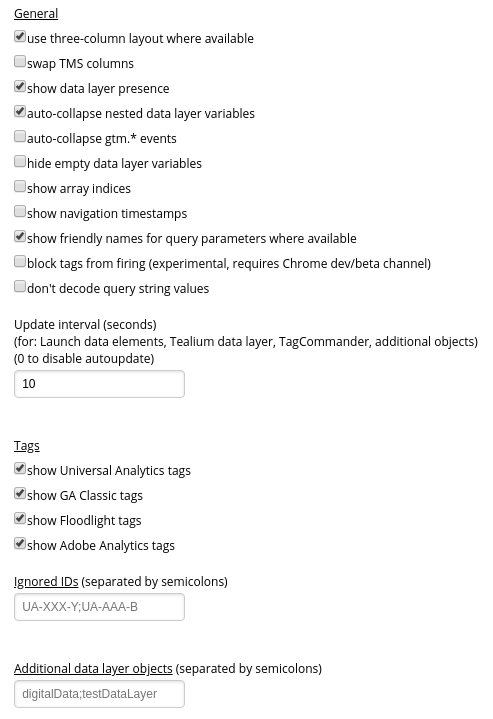 Adobe Analytics pageview: props, eVars, campaign, pageName, site section, events, etc. 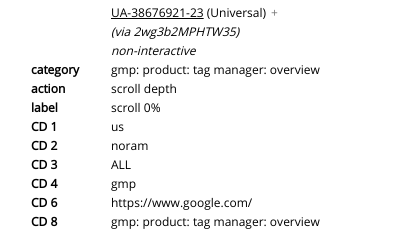 Click the + next to the tag brand to view the full list of query parameters and values in the tag. The gear icon (“Options”) provides access to your settings. The red X icon (“Clear History”) will clear your history, with the exception of preserving some info about the currently active page. The disk icon (“Import / Export”) will allow you to export a session to a JSON file, or import and review/add to a previous session. The magnifying glass icon (“Toggle Search”) toggles the search bar, which will filter your data as you type your search phrase. Note that search is case-insensitive. Search can also be toggled with the keyboard shortcut Ctrl+Alt+F. Settings are automatically saved as you edit them. show data layer presence: enable (default) or disable the TMS logo / X in each page group. auto-collapse nested data layer variables: when this option is enabled (default), nested variables such as Google Analytics enhanced ecommerce will automatically be collapsed to save space. auto-collapse gtm. 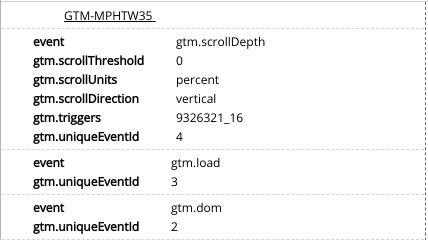 * events: when this option is enabled, data layer events like gtm.click and gtm.scrollDepth will be collapsed by default; click the event to toggle it. hide empty data layer variables: when enabled, if no value is set for a key, hide it entirely. show array indices: when enabled, show a faint indicator of the array index for values inside array-like data layers. show navigation timestamps: when enabled, show a faint timestamp for each pageload. block tags from firing: requires use of the Chrome dev or beta channels. When this option is enabled, supported tags will be blocked from actually sending to the analytics platform. Note that blocking does not take the Tags selections into account (i.e. all supported tags are blocked, regardless of whether or not they are shown). All supported tag types are shown by default; these can be individually disabled. To filter out tags hitting specific analytics properties, enter the property IDs here. Release notes and history are available here.